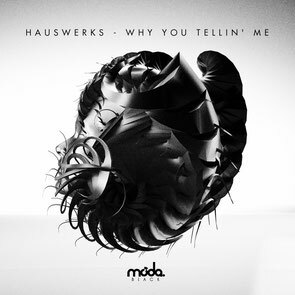 Hauswerks ‘Why You Tellin’ Me’ EP was released this week via Jaymo & Andy George's Moda Black, comprising three original tracks from the man himself. Hauswerks, one of Moda Black’s rising stars, returns to the label with possibly one of his most dynamic releases to date. As ever the soul of these tracks lie in Hauswerks’ meticulous drum work, providing each track with an insatiable driving force that hits you right in the waistline. Leading the charge ‘Why You Tellin’ Me?’ harnesses a kinetic vintage chord lead and swinging grooves that, in a world of yesteryear productions, sounds classic and modern without becoming passé. ‘Make Me Feel’ keeps the grooves locked in, but takes things into late night territory. Shuffling breaks, pitch bent chord stabs and throbbing kick drums underpin the twisted top-line, creating a track of numerous layers. Closing the EP, Hauswerks steps forward with a track that has been used as a curveball move in all his sets of late. ‘It’s You’ is built around a re-pitched and repeated vocal stab that, when combined with his signature drums, form a pumped-up club-centric track.